Click on through to read the press release. JACKSONVILLE, Fla.–(BUSINESS WIRE)–Winn-Dixie Stores, Inc. (NASDAQ:WINN) today announced it recently signed an exclusive agreement with Green Secure Solutions, Inc. to use its patent-pending process to clean, sanitize and protect shopping carts, hand baskets, handicap carts, food trays and other equipment at the grocer’s 484 stores. 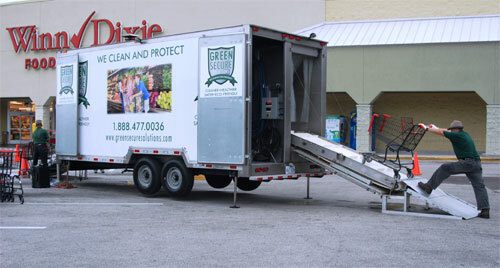 Green Secure Solutions’ mobile sanitizing units act like a car wash, where shopping carts and other equipment are cleaned with a high-temperature, pressurized shower sterilized with hydrogen peroxide and ultraviolet light. Once the carts are dry, technicians from the Pompano Beach, Fla.-based company electrostatically apply Bioshield 75, an award-winning, water-based product that creates a highly durable coating that bonds to surfaces on which it is applied. Bioshield 75 is registered with the U.S. Environmental Protection Agency and accepted by the U.S. Department of Agriculture for use in food preparation areas. It is effective in eliminating and preventing growth of E. coli, staphylococcus, MRSA, salmonella strains and other potentially harmful microorganisms. Winn-Dixie Stores, Inc., is one of the nation’s largest food retailers. Founded in 1925, the Company is headquartered in Jacksonville, Fla. The Company currently operates 484 retail grocery locations, including 379 in-store pharmacies, in Florida, Alabama, Louisiana, Georgia and Mississippi. For more information, please visit www.winn-dixie.com. At Green Secure Solutions, Inc. we set out to redefine the industry standard for commercial cleaning and microbial protection for a wide variety of industries and applications. Gone are the days of using harmful, poison-leaching disinfectants that provide no lasting protection to the surfaces which they are applied. We have revolutionized the very concept of preventing microbial growth with a system that is safe, effective, long-lasting and environmentally friendly. We stand behind our products and services 100% and enjoy having the opportunity to prove their effectiveness in real-world situations. To learn more, go to www.greensecuresolutions.com.